Hello! I have a puzzle, and perhaps you can help me with it! I had dinner at one of the Indian cafes on East Ham High Street the other day, and I had a cup of masala tea afterwards. It came in a vessel like the ones pictured — a metal cup inside a metal bowl/saucer. That wasn't the confusing part, though; the confusing part was that the tea had been poured into the cup so it overflowed into the bowl. Is this normal? I know some British people like to drink their tea out of the saucer, and I seem to remember that there are various drinks around the world that are customarily poured to overflowing (e.g. sake served in a cup inside a cedar box). I haven't heard of this for masala tea before, though. It also made it a bit awkward to drink, since the bottom of the cup dripped every time I lifted it up. 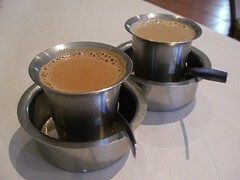 That's a traditional way of serving a "full" tea in South India. You're meant to drink from the saucer and use the cup to top the saucer up. Doing so cools the tea. It's my understanding that this is not so much about the flavour but that it allows the tea to cool. A "half" tea comes in the same set up, but without the tea overflowing into the saucer. Fantastic, thank you! So I should take the cup out of the saucer, set it down on the table, and then just drink from the saucer? Yep. It seems counter-intuitive, since the main point of a saucer in this country is to avoid covering the table/tablecloth in rings and drips, but that's how you drink it. It's perfectly acceptable to abdandon drinking from the saucer after a while once the chai in the cup has cooled enough, if you find the saucer awkward to drink from. Funnily enough, I was just about to write a post about meeting up with friends, since I've been non-social for a couple of months and I feel the need for company. I'm busy with "the book", work (upcoming AGM on Monday) and revising for a Java exam in mid-June, but after that I have a pretty clear calendar. Is there anywhere in Ilford you wanted to try? Cool, thanks so much for the info. Re meeting up — yay! I have my eye on Mandarin Palace, but Kanchans also needs a proper RGL review. Some time in the latter half of this month would be good for me. I can't do Monday evenings, and I'm busy on Thursday 18th, Saturday 20th, and Sunday 21st, but apart from that I'm free. There is also a p;lace called, um, elephant royale in gants hill too that is lovely (It has a stream running thru it!) but expensive. Oh, yes, Elephant Royale — I just read a review of the Isle of Dogs one the other day, and it mentioned they had a Gants Hill location too! Will definitely let you know... it would be great to have you along.